Although many consider cold-formed steel framing to be a “new” construction product, it actually has been used in North America for over 100 years. Use of cold-formed steel members for construction of buildings started in both the United States and England in the 1850s. Use was largely experimental, and limited to a few basic structures. During the 1849 California Gold Rush, A roofer from New York, Peter Naylor, advertised “portable iron houses for California.” The advertisement stated that the iron was grooved so all parts could slide together. According to the ad, “20’ x 15’ homes could be built in less than a day, were cheaper than wood, fireproof, and more comfortable than a tent.” Mr. Naylor used metal roofing in his practice in New York, so undoubtedly many of the components of these “iron houses” were actually cold-formed steel. In the 1920s and 30s, acceptance of cold-formed steel as a construction material was still limited, since there was not an adequate design standard, and no information on the use of the material in the building codes. In 1933, the Chicago Century of Progress Exposition (World’s Fair) featured a “home of the future,” completely framed with steel. Architect Howard T. Fisher was responsible for the development of this home, based on his research into the use of steel in railroad cars and other manufacturing industries. According to Fortune magazine (April 1933,) Fisher approached the Pullman Car Corporation and said, “You have had more experience with prefabricated housing in metal than any other manufacturer. Help us learn how to build homes without wheels.” He did the same with other construction product companies. By mid-1932, he had developed his plan, and founded General House, Inc. The New York Times reported, “Just as Henry Ford tapped a totally undeveloped field for automobile sales, so General Houses hopes to tap a totally undeveloped field for housing when it offers first class shelter on the installment plan for $30 a month. The houses will be adaptable to exchange for newer and better models and can be set up or taken down in four days.” According to the 1936 General Homes catalog, “Approximately two million people visited our display house within five months at the 1933 Century of Progress Exhibition.” Unfortunately, the catalog gave few details about the structural system that was used. Despite the relatively low price, good terms, and apparent popularity at the Chicago Exposition, the company was out of business by the beginning of World War II. Also during the 1933 Chicago Worlds Fair, Armco Steel Corporation introduced the first standing seam metal roofing panel. During and after World War II, the metal building industry and the steel framing industry began to differentiate, diverge, and grow. While framing found its way into homes such as Lustron, metal buildings used roofing, siding, and sheet products to develop storage buildings, Quonset Huts, and similar structures for barracks, hangars, and other facilities that required rapid, lightweight, and strong construction. In the 1940s, Lustron Homes built and sold almost 2500 steel-framed homes, with not only the framing, but finishes, cabinets, and furniture all made from steel. Lustron’s founder, Carl Strandlund, originally planned to manufacture porcelain-enamel coated cold-formed steel panels for the exterior cladding on service stations. In 1945, there were still post-war restrictions on the use of steel, so Strandlund traveled to Washington to see if he could receive an exemption. He did not get what he came for, but learned that the government was very interested in providing attractive, permanent, affordable housing for the soldiers returning from World War II. Strandlund envisioned homes built in the assembly-line process of the automobile, using the steel panels for framing, cladding, trusses, and even the roof tiles. He developed his business plan, and began taking orders for homes in 1946. In 1947, he requested and obtained federal loans totaling over $33 million. He leased an aircraft hangar from the U. S. Navy in Columbus, Ohio, and started building Lustron homes. Although over 20,000 home orders were received for homes between 1946 and 1948, only 2,498 homes were delivered and constructed, and the company eventually went into bankruptcy. With all this work being done in the residential marketplace, commercial and industrial applications of cold-formed steel framing were being tried, although without as much fanfare and marketing as the residential efforts. One example is the Virginia Baptist Hospital, built around 1925 in Lynchburg, Virginia. The walls were loadbearing masonry, but the floor system was framed with double back-to-back cold-formed steel lipped channels, as shown here on the original architectural drawings. These joists were shown with a ][ (back-to-back channel) symbol on the drawings, at 19” on center, and overlaid with metal lath supporting a cement-based fill. Each channel, made from 0.073” thick steel, is 8” deep, 2 ¼” wide, with a ½” stiffening lip. According to Chuck Greene, P. E. of Nolen Frisa Associates, the joists should have been adequate to carry the initial loads and spans, based on current analysis techniques. Greene engineered a recent renovation to the structure, and said that for the most part, the joists are still performing well and have plenty of continued service life. A recent site observation during this renovation confirmed this: these joists from the “roaring twenties” are still supporting loads, over 80 years later. Although requirements for hot-rolled structural steel had already been adopted into building codes by the 1930s. there were no provisions for cold-formed steel. Key differences between hot-rolled and cold-rolled steel made it impractical to apply hot-rolled provisions to cold-formed structural products. First, cold-forming the material allowed for shapes that differed greatly from the traditional “I beams” and unlipped channels: cold-formed steel shapes have consistent thickness across their cross section, no tapered flanges, and an inside and outside bend radius at corners. Second, structural behavior of the members is much different. Due to its thin shape, cold-formed steel members initiate local buckling with very little loading in some configurations. However, after this initial buckling, members can continue to take more and more load before the member yields and fails. This first specification contained six sections: General, Design Procedure, Allowable Design Stresses, Connections, Design of Braced Wall Studs, and Tests. Applicability was limited to “steel sheet or strip less than 3/16” in thickness.” The yield point of steel used ranged from 25 ksi to 33 ksi, and the base material permitted for forming sections was limited to products referenced in ASTM specifications A245 and A246. Compared to today’s Specification, data was very limited, but it was a start. Designers and specifiers now had a code-adopted standard from which they could specify material, and manufacturers could develop material and property tables based on standard methods. However, the industry still had a long way to go: the information on connections was limited to welds, and there was no data on the design of members with web or flange holes. The basic design stress was based on a safety factor of 1.85; relatively high compared to the 1.65 value published in the American Institute for Steel Construction’s specification during the same era. In the 1960 version of the AISI Specification, this basic design stress safety factor was reduced from 1.85 to 1.65, to be in line with the other steel specifications. At the same time that cold-formed steel framing was gaining ground as a construction material, the use of gypsum board was growing. Patented in 1894 by Augustine Sackett, the original gypsum board was brittle, rough, combustible, and did not have a smooth layer for finish. However, over the next 50 years, improvements were made such as replacing the wool felt paper layers with paper, air-entrainment to make the product lighter and less brittle, and development of “type X” board for fire resistance. By 1955, half of all new homes were built using gypsum wallboard, and the other half was built using gypsum lath and plaster. Looking toward the commercial market, the Gypsum Association and its member companies had run a series of fire tests and published a manual on fire resistance since 1931. There was a desire to develop non-combustible systems to prevent disasters in high-rise structures, such as the 1946 Winecoff Hotel fire in Atlanta, where 119 people died. Loadbearing masonry partitions had been used, but they were heavy, required large amounts of labor and water, and left messy mortar droppings from construction. Because the masonry partitions could be plastered directly, they created no market demand for the gypsum board product. The gypsum companies went to work to develop a non-combustible substrate that could support partitions made from gypsum board, and steel framing appeared to be the answer. Some of the first metal stud walls were made from unlipped channels, with metal lath wire-tied to the flanges. However, there was not an easy method to nail the gypsum board to the studs. United States Gypsum Company developed a nailable stud system called Trussteel. Advertised as “the original open-truss design studs for the erection of hollow, fire-resistant partitions… formed from cold-drawn No. 7-ga. Steel wire rods with a tensile strength of 90,000 psi – substantially higher that the hot-rolled sheets from which pressed metal and edge angle studs are formed.” The initial design was for nails to be installed between the double wires that formed the “chord” of the Trussteel members. However, it was difficult for framers to install the nails in just the right spot to get it between the wires, and double studs had to be installed at panel joints. Clips were eventually used instead of nails for veneer plaster products, but for finishing gypsum board, the clip flanges got in the way. The gypsum board and steel stud industries were able to find the “silver bullet” for non-combustible partitions: the self-drilling screw. Made from hardened steel, the points of these screws had either a self-piercing “sharp” point, for the thinner steel framing members, or a driller point for thicker steel. These screws, and the parallel development of tools to drive them during the 1950s created an expanded opportunity for steel framing in the commercial marketplace, and steel framing companies began to pop up across North America. During the 1960s, these partition applications were expanded to new systems, such as exterior framing with brick veneer, and interior applications such as shaft wall, where specially configured studs held fire-resistant gypsum panels in a configuration that could be built from one side. This permitted construction of walls around stair towers and elevator shafts without scaffolding being built up inside the shaft, or the weight or mortar droppings of masonry construction. The first shaft wall system, patented by USG, was first used in the World Trade Center buildings in New York City. As the steel framing market grew, it became more difficult for architects and engineers to specify a standard product. Most framing members had similar properties, were made to the same ASTM specifications, and had their own span and load tables. But slight differences in the configuration created differences in strength and stiffness, which led to confusion in the marketplace. During the 1990s, two organizations emerged in an attempt to provide better standardization of the product. On the east coast, the National Association of Architectural Metal Manufacturers (NAAMM) formed the Metal Lath and Steel Framing Association. On the West Coast, under the leadership of Neal Peterson, the Metal Stud Manufacturers Association (MSMA) was formed. The MSMA developed a single catalog, with load and span tables that were the same for all of its members. This made it much easier for specifiers and designers. In 2000, these two organizations merged, to form the Steel Stud Manufacturers Association (SSMA.) Since 2001, the SSMA has produced span and load tables, based on a standard product nomenclature and standardized thicknesses and sizes. Also in the mid 1990s, some west coast steel manufacturers realized that many engineers did not understand the complexities or design methodologies of the AISI Specification. To help provide design guidance, technical information, and user-friendly information to engineers, the Light Gauge Steel Engineers Association (LGSEA) was formed in the San Francisco Bay Area in 1994. Starting with only 14 members, the organization had grown to over 800 members in 10 years. In 2005, the organization became a part of the Steel Framing Alliance, and in October, 2006, announced its new name: the Cold-Formed Steel Engineers Institute (CFSEI.) This group still embraces the original mission of the LGSEA: to provide information to engineers and designers for the safe and efficient design of cold-formed steel structures. The AISI standards development effort did not stand still during this time. Since the 1946 edition of the Specification, nine subsequent versions were issued with updated data and added information for designers. 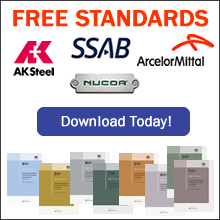 The latest edition, the 2001 “North American Specification for the Design of Cold-Formed Steel Structural Members” with 2004 Addendum, contains provisions that apply in Canada, the United States, and Mexico. Fastening types include bolts, welds, and screws, and provisions are now included for holes in members. In the late 1990s, AISI realized that while the Specification was very comprehensive in covering design information for all types of cold-formed steel structures, special provisions were needed for the more narrow requirements of the steel framing industry. In 1999, the AISI formed a new committee, the Committee on Framing Standards (COFS,) to develop standards specific to steel framing used in light-frame building construction. In their short history, the COFS has successfully developed six standards that have been adopted by the building codes. The General Provisions, Header, Truss, Wall Stud, and Lateral Standards have been adopted by the International Building Code, and the Prescriptive Method and General Provisions Standards have been adopted into the International Residential Code. The future of steel framing in North America looks promising. The COFS is working to develop its standards into North American versions, with applicability in the U.S., Canada and Mexico. Product Data and Span and Load Table standards are in development, to help engineers continue to specify standard products. At the same time, new products are being developed: truss and wall panel systems, mobile rollforming, Joist and stud systems with large stiffened holes, embossed members, thermally efficient studs, and boxed sections are all being developed or in production. CFSEI has design guides in development for each of the COFS standards, as well as CAD details, tech notes, and online and live steel framing design courses. And software developers have released programs that use the provisions of the Specifications and standards to provide rapid, accurate, and in some cases 3-D full-structure Building Information Modeling that incorporates steel framing member and system design. These new products, publications, code-adopted standards and training opportunities make it easier than ever to design with steel. Yu, Wei-Wen. “Cold-Formed Steel Design, Third Edition.” 2000, John Wiley & Sons. Page 1. Metal Building Manufacturers Association. “50th Anniversary Collectors Edition: a Supplement to Metal Construction News and Metal Architecture.” July, 2006. Page 7. Craftsman Book Company. “Build Smarter with Alternative Materials.” Chapter 4, page 1. Yu, Wei-Wen, D. S. Wolford and A. L. Johnson. “Golden Anniversary of the AISI Specification.” 13th International specialty conference on Cold-Formed Steel Structures. 1996 St. Louis, MO. Pages 1-3. Winter, George. “Light Gauge (Thin-Walled) Steel Structures for Building in the U.S.A.” preliminary publication, 4th Congress of the International Association for Bridge and Structural Engineering, 1952. p. 524. The Gypsum Association. “75 Years of service.” 2005, the Gypsum Association, Washington, DC pages 16, 19, 20. USG Corportation. “Gypsum Construction Handbook, 2nd Edition.” 1982, United States Gypsum. Page 243.